When all was said and done, Apollo 12 would result in a second manned moon landing in November 1969, just four months after Apollo 11. Commanded by Pete Conrad, Alan Bean accompanied Conrad to the surface while Richard Gordon, Jr. kept the getaway vehicle running. But less than a minute after launch something happened that could have been a disaster. Lightning struck the vehicle. The first strike caused the avionics to falsely detect an overload and shut down the spacecraft’s fuel cells that produced electricity for the instruments. A second lightning strike took out some key instruments. The backup batteries could not handle the launch load and some other systems begin to shut down. Think about that for a minute. You are in a cramped space in a seven million pound vehicle, burning fifteen tons of fuel per second, accelerating towards about 6,000 miles per hour. (See the video below to relate that to elephants.) Suddenly dozens of warning bells and lights go off. There was very little time to react. There were several abort procedures, although if there was damage to the spacecraft, you couldn’t be sure those were going to work, anyway. One of the flight controllers, 24-year-old John Aaron, was responsible for electrical and environmental consumption. He remembered a test of a power supply malfunction that caused similar haywire telemetry. He asked the flight director to advise the crew to switch Signal Conditioning Electronics (SCE) to Aux. The problem was, the flight director Gerald Griffin, and the capsule communicator Gerald Carr didn’t know where that switch was located. Neither did Pete Conrad. Luckily, Alan Bean remembered a training incident — maybe the same one Aaron remembered — and systems were restored. Don’t think this is a big deal? Have a look at that cockpit. Can you find the SCE switch? We’ll wait. Need a hint? Look at the right-hand panels. Still stuck? How about panel C? On the bottom row of panel C there are six toggle switches. The fourth from the left is the one Bean had to find. While a few million pounds of rocketship was shaking all around him. The crew made it to orbit, but there were still concerns. They checked everything they could. While it all seemed to be working, flight controllers were afraid the lightning could have caused problems with the parachute deployment. The crew could have a very successful mission, return home, and crash out of control into the Pacific. There wasn’t any way to be sure, so they decided to not inform the crew. Luckily, at the end of the mission, the recovery system worked fine. By the way, you can hear the crew dealing with the emergency in the video below. They sound a little worried, but not nearly as bad as you would think. After it was over, though, you can hear the relief in their banter. Pete Conrad was known for his sense of humor. We’ll never know what he would have said if he’d been the first man to walk on the moon. But he was the third man, so he said, “Whoopie! Man, that may have been a small one for Neil, but that’s a long one for me.” That sounded extemporaneous, but in fact, he had made a $500 bet with a reporter that he would say those words when he landed on the moon. Apparently, he never collected on the bet. The mission was mostly a success. One of the biggest goals was to prove they could land at a specific spot. Apollo 11 did not land where it had planned because the surface wasn’t suitable there. Bean had to adjust the landing zone a little, too, but not much. The plan was to land close — but not too close — to the Surveyor 3 probe. They were 600 feet away when they landed, although the probe was behind them so they couldn’t be sure right away how close they were. Supposedly, there was a “stand up EVA” where Conrad popped his head out the hatch to look for Surveyor. I say supposedly because that’s a little moon landing conspiracy theory about why there’s no record of it. There were other minor hiccups. The crew had the first color TV camera on the moon and mistakenly pointed it at the sun, burning out one of the imaging tubes. Bean accidentally left some exposed film on the lunar surface. We wonder if someday that film will be recovered and developed — probably not, though, as it is probably ruined by radiation over that much time. Another camera glitch: Bean smuggled a non-regulation self-timer so he could take a picture of both of them together on the surface. The timer was misplaced which is probably a blessing in disguise, since that picture would have caused a frenzy in the conspiracy theory circles. To add injury to insult, when the capsule splashed down, a camera came loose and struck Bean’s forehead. He was knocked out and required six stitches. Still, better than crashing into the ocean with no parachute. You could argue that 12 is a lucky number because none of the bad things that happened turned into a disaster. By that token, though, so is 13 because despite all odds, the crew made it home. The truth is, we were pushing the envelope going to the moon back in those days. Each mission had problems. Apollo 11 overran its computers. We just talked about 12, and the issues on 13 are well known. Apollo 14 almost didn’t have a successful docking between the command module and the lunar module: it took six attempts and a non-standard procedure. It also required a software patch in flight to solve a problem with a solder joint. On top of that, the landing radar failed to lock due to an unrelated software bug. Proving that practice doesn’t always make perfect, Apollo 15 had a problem with the Saturn V booster that almost forced an abort and damaged a telemetry package. They also landed with one foot in a crater which had the lander pitched ten degrees off the vertical. An oxygen leak on the moon turned out to be an open valve on a space toilet. On reentry into Earth’s atmosphere, one of the parachutes failed to deploy. Ever wonder why there are three parachutes? It’s because they need two. Apollo 16 was the first to suffer a launch delay due to technical problems including an accidentally damaged fuel tank. While orbiting Earth there were minor problems with environmental controls and the rocket’s control system. More seriously, the lunar module had damage to its skin forcing the ship to adopt a corkscrew-like motion to ensure the damaged area didn’t overheat. En route to the moon, the navigation system decided to fail, requiring a realignment using the Sun and the moon as reference points. The landing almost didn’t happen when the command module’s steering jets developed a problem and flight controllers worried they might need the lunar module to help send the crew back to Earth. On the moon’s surface, the crew dealt with a faulty lunar rover, a broken fender, and a snapped cable snaring one of the astronauts. Even the final mission — Apollo 17 — had problems. An automatic shutdown stopped the launch 30 seconds before the launch time. The lunar rover lost another fender which was famously repaired with duct tape and plastic maps. 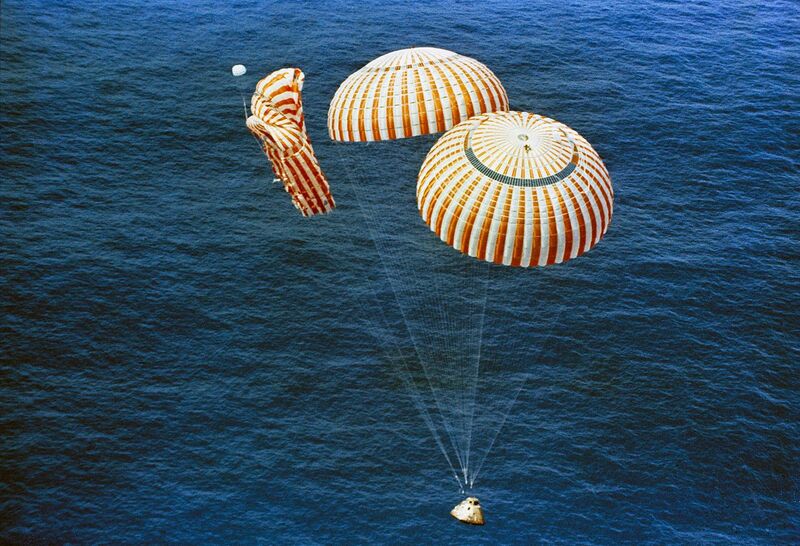 I think the Apollo near disasters are a great lesson in engineering. The fact is, things don’t always work. But smart people can usually find a way to make things work. This was exemplified on each and every Apollo mission, not just Apollo 13. Back in the 1970s, RCA had a recruitment ad that said, “The best electronic brains are still human.” Despite the media hype about artificial intelligence, people are still our best problem solvers. It is tempting to automate everything. When that works, that’s fine. But how many times have you had a piece of software or hardware that is supposed to “just work” fail and then not give you enough diagnostic information because of the designer’s hubris? Some people want to take humans out of spaceflight for cost and safety reasons. That’s a mistake. Problems will occur and they will — at least for the foreseeable future — require humans to fix them. And there are other benefits. In our own designs, we should think about what people will need when the problem we didn’t think about happens. When faced with a problem, too, we can draw inspiration from the men and women who built and operated the systems that put a dozen people on the surface of the moon against incredible odds. “On reentry into Earth’s atmosphere, one of the parachutes failed to deploy. Ever wonder why there are three parachutes? It’s because they need two.” re Apollo 15 – that’s not quite accurate, it deployed fine but one of the final procedures involves dumping the (extremely toxic) hypergolic reaction control system fuel so there’s no chance of it leaking and killing the passengers on splashdown; that hypergolic fuel just happened to puncture a hole through one of the parachutes, producing the image you see above. a. The most probable cause of the anomaly was the burning of raw fuel (monomethyl hydrazine) being expelled during the latter portion of the depletion firing and this resulted in exceeding the parachute-riser and suspension-line temperature limits. b. The forward heat shield passed extremely close to the command module during the descent phase; however, at the time of the anomaly, the heat shield was 700 feet below the command module. c. Impact of the forward heat shield on the parachute risers, suspension lines, canopy, or spacecraft will not cause catastrophic damage. d. The failure of a single connector link will not cause a main parachute to fail. e. The flaw observed in the recovered parachute connector link probably occurred after the plating operation, and could be due either to saltwater-induced stress corrosion or hydrogen embrittlement. We need something to save 2018. Forget the moon. Forget Mars. It’s going to take a trip to Trappist-1 to save a year like this one! 2018 is one of the best years on record so far. Unemployment the lowest in 40 years, GDP the highest since the 80’s, labor participation the best in many, many years. With a booming economy, America can think about getting back into Moon missions once again and then …maybe…to Mars. Hydrazine does not make these rockets go up, money makes these rockets go up. Nazis marching openly in the streets, mass shootings every week. Yep, it’s a great time to be alive. I was talking about America, not whatever country you may live in. Sorry for the confusion. Yeah, no. Some corporation, maybe. America? No way. Q2 2018 4.1% looking good! Yes, I get the point. You are cherry picking because those numbers in 2014, both of them, were revised down well below 3%. Obama even said that 3% GDP was no longer possible and GDP in the 2’s was the new “normal”. (Are you calling him a liar too?) I was not making a political point here but, your hatred for our President is obvious and I am just going by the REAL numbers readily available to anyone who searches. Posting numbers that were later revised down is disingenuous and is the type of thing CNN does on a daily basis which is why they have earned the label FAKE NEWS. Hopefully, you are smarter than that. There are many other sources for this, including the U.S. government’s own figures but…this shows Obama averaged 1.48% GDP. I can also post links to where he claims this is the new “normal” if you like and you can watch, and hear him say this himself. He also claimed Trump would need a “magic wand” to be able to bring back jobs to America. (I can post links to videos where you can watch and hear him say this as well.) All Trump did was to reverse all of Obama’s executive orders that were strangling our economy and cut taxes so corporations would move back to the U.S. instead of leaving it. Economics 101. That’s what you get for sending Mr. Bean to the moon! Now, there is an idea for a movie! It will be better than sending Ryan Gosling. Didn’t he hammer the radio isotope generator to make it fit in to the fixture so they had power for the lunar experiments. Which moon walker broke the cable of an experiment right at the connector? I don’t remember which Apollo mission it was, but I do recall reading a day or two later, the transcript of him apologizing to Mission Control. I’m lazy finishing the last 10% of my 4D Political Analysis Monitor, talk about a lonely mission into black space with no Mission Control! No comment about “steely-eyed missile men”? Disappointed. I read Bean’s account of his experience on the Moon. He said he completely forgot about the camera timer he’d stashed in a leg pocket of his spacesuit. When they were packing up to leave, emptying out all non-essential gear from their suit pockets, he found the timer. He stood there a bit, contemplating if they had time to setup a camera to get the shot, then chucked it over his shoulder and continued with getting ready to leave. The episode of HBO’s “From the Earth to the Moon” on this flight is very good: “That’s All There Is” It reenacts the lightning strike, the forgotten timer, the crew’s camaraderie… and what happened to the men ahead of them whose loss caused Bean and others to end up in an all-Navy crew for Apollo 12. >Can you find the SCE switch? Right side, middle of the bottom row. Took about 2 minutes, but most of that was from trying to read the text in such a low res image. That all-Navy crew had their hands full on that mission. There was a bit more to the landing than getting close to surveyor. It meant to demonstrate precision landing using teamwork from MSFC, the Command Module Pilot, and the LEM crew. MSFC would get them close, then the LEM crew would get it down on the surface. Afterward the CMP would verify their position using the AGC and the guidance computer’s sextant. Apollo 17’s launch hold was a screwed up program in the launch sequencing computer. Some buggy lines forced the sequencer into an near abort criteria that would have fired the escape tower, causing a scrub and roll back of the stack to the VAB. Fortunately, the team hot-wired the LSC and hand-keyed in the rest of the sequence, enabling the launch to proceed. Now if anyone read Lost Moon, you would have gotten a little bit more on the engineering aspect of the return mission, especially the batteries. They had to bridge the descent and ascent batts with the CM and CSM batts, charging them up and enabling key telemetry readings to be taken, especially interior temps and instrument status. The descent batts could not take much more of the stress and blew out two cells in one battery, causing a minor stir until Systems assured them the rest of the battery would hold up. I met Al Bean and helped him organize his presentation materials, some time ago when he was keynote speaker for a convention I was tech’ing. Extremely humble man, the only one of the Apollo astronauts–my personal heroes–I’ve had the good fortune to meet. At the time, astronauts were repairing the Hubble, and I was honored to brief Captain Bean on the progress of the mission (which I was following closely, and obviously he wasn’t). Ever wonder how the Saturn V stayed on course until SCE was flipped to AUX? This incident was also a vindication of the engineering decision to place a seperate computer within the Saturn V rocket to control it into orbit. While the command module computer temporarily lost its mind, the Saturn V’s computer kept the launch on target.